These pins are die struck, with enamel colors of Sandy Hook Elementary...green and white. The pins have gold plating in an awareness ribbon style. The left side of the ribbon is inscribed with the day of the Sandy Hook tragedy. The angel is gold plated. Each pin includes a standard clutch back, and is individually poly bagged. 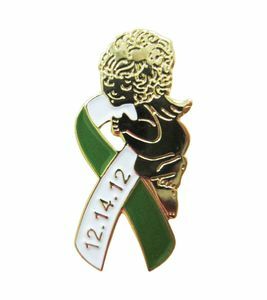 100% of the proceeds will be donated to the Sandy Hook Elementary PTA for each angel pin sold! Autism Winter Teddy Bear 8"